Yesterday, The police confirmed the death of one person in Apapa during a protest by tanker drivers. Unofficial reports however said three persons died in the mayhem. The drivers’ protest started when one of them was shot dead in front of Diamond Bank by a mobile police officer. The policeman allegedly fled to Sterling Bank on Burma Road to stay with his colleagues there. To avert an attack, the policemen attached to the bank started shooting into the air. Two drivers were allegedly killed and one was injured in the shooting. An eyewitness, Sunday Abiodun, said enraged by the action, the protesting drivers and their motor boys, torched both banks. Abiodun said: “This morning, a police officer attached to Diamond Bank, asked one of the truck drivers operating here at Apapa port, to give him N1,000 and the man said he was not the owner of the vehicle parked in front of the bank, that he just came to pick his phone inside the truck. Attempts by men of the Lagos State Fire Service, Iponri, to put out the fire, was rebuffed by the drivers. t was gathered that the firemen left for fear of being assaulted by the drivers and their trucks vandalised. It was gathered that it took the combined efforts of Rapid Response Squad (RRS) operatives, Area B police command, Nigerian Navy Ship (NNS) BEECEROFT and Nigerian Army Signal Corps to contain the situation. The security operatives also stopped the rioters from setting a tank farm ablaze. 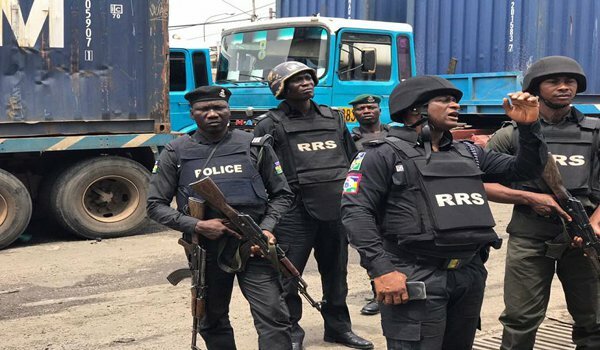 The RRS operatives led by their Commander, Tunji Disu, an Assistant Commissioner of Police (ACP), also prevented hoodlums from looting the affected tanks. A senior officer, who was ground, said: “Those tanker drivers are very irrational. When the policemen attached to one of the banks shot at the tanker driver, they regrouped and stormed the bank in anger. “They first demanded that the policeman who shot their colleague be released to them. When their demands proved abortive, they took the law into their hands. “They contributed fuel from their tanks and set the bank ablaze. The entire situation caused a stampede as both workers and bankers scrambled to escape from the back of the bank to safety. “The drivers were still on the rampage in the first bank when they heard that the policeman had taken refuge in the next bank. “Armed with that information, they simply went over to the said bank and carried out same carnage, irrespective of the presence of innocent bystanders. “They also attacked innocent policemen going about their own businesses. They stabbed no fewer than three policemen who didn’t know what was happening. The Police said they had arrested the officer, who fired the fatal shot and 17 others over the disturbance. Lagos State Command’s spokesman, Olarinde Famous-Cole, an Assistant Superintendent of Police (ASP), said the police went to the scene following a distress call from the Chief Security Officer (CSO) of a new generation bank. “The caller said hoodlums were trying to take laws into their hands by setting the bank ablaze following the shooting of a tanker driver by a policeman, attached to the bank after a altercation,” he said. Famous-Cole said operatives of the command including the Area Commander Apapa, RRS and other security agents rushed to the scene. The Commissioner of Police, Fatai Owoseni, was also there. Famous-Cole said if not for the police’s quick intervention, the hoodlums would have wreaked more havoc on Apapa. He explained that a mob had gathered in front of the bank demanding the release of the policeman to it. The bank, he said, refused, leading to the arson and attack on another bank branch on Wharf Road. The fire at the banks, the ASP said, was put out by the police and other security agencies. He said the driver whose name he simply gave as Azeez was confirmed dead on arrival on hospital. “Contrary to reports making rounds in the news, only one tanker driver was shot. Association of Maritime Truck Owners (AMATO), chairman Chief Remi Ogungbemi told The Nation that the situation had been brought under control. Sterling Bank said the policeman ran into its premises to avoid being mobbed, urging its customers to patronage nearby branches. The bank said: “An armed mobile policeman fleeing from an irate mob after shooting a tanker driver disrupted banking operations at the Sterling Bank branch on Creek Road this morning. He ran into the premises of the bank to escape being lynched. “Security operatives attached to the bank disarmed and arrested the fleeing mobile policeman but did not hand him over to the irate mob. “The mob got upset and attacked the bank with the intention of unleashing mayhem on staff and customers. The branch’s reception area was vandalised and set ablaze. “The security operatives attached to the branch prevented the mob from entering the branch while evacuating staff and customers before the arrival of police reinforcement. The branch has been temporarily shut down. Petroleum Tankers Driver (PTD) said none of its members was shot dead. It said reports that some of its members were killed by the police, after loading fuel in Apapa, Lagos, was a figment of the imagination of those who wish out to cause crisis between the two groups. PTD’s South-West spokesman Tayo Aboyeji, in a statement, said tanker drivers, the police and other security operatives were like members of the same family. Aboyeji said: ‘’The police, the National Union of Petroleum and Natural Gas Workers (NUPENG) and its various arms are established by law, to discharge their duties, without interference. They mutually benefit each other and have not engaged themselves in fracas. Members of PTD have not involved in any act of criminality or lawlessness’’ he said.